February 12, 2019 (OTTAWA, ON) – Timbercreek Communities unveiled a new five-part social framework to guide the future of Heron Gate at a public open house on Monday, February 11th. Timbercreek will work with Councillor Jean Cloutier and the City of Ottawa to ensure this framework serves as a roadmap towards a healthy and diverse community. No further demolition of occupied units. No future demolition of occupied units will take place at Heron Gate unless affected tenants can relocate to newly-constructed equivalent units at the same rent. Affordability. Timbercreek will work with Councillor Cloutier and the City of Ottawa to ensure up to 20 per cent of total new units at Heron Gate will be built as affordable units. 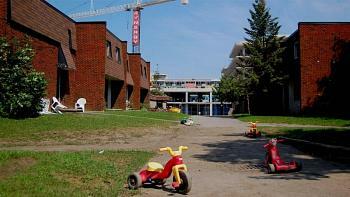 The City of Ottawa defines affordable rental rates as 30 per cent of income. Housing diversity. Timbercreek commits to providing a diverse mix of housing that meets residents’ needs and reflects the community’s social fabric. This includes adding 3 and 4-bedroom family-style units, and ground floor accessible units. Social enterprise. Timbercreek will continue to work with Councillor Cloutier, the City of Ottawa and others to create training and employment opportunities for the Heron Gate community. Since purchasing the Heron Gate property in 2012, Timbercreek has created numerous programs and opportunities for its community. Over the past two years, Timbercreek has started a summer renovation program, hiring youth from the neighbourhood for paint jobs around the community. Timbercreek has also provided free meeting spaces for community and youth organizations, and most recently, made a significant contribution to the Boys and Girls program at Ridgemont High School. Green space. Timbercreek commits to enhancing amenities and green space, including working with Councillor Cloutier and the City of Ottawa on improvements to Sandalwood Park. Timbercreek will submit plans to the City of Ottawa this spring. Since January 2018, Timbercreek has engaged in multiple community sessions, with the fourth occurring last night.